During the past several years, there has been a huge increase in Chicago trustees under Chapter 13 demanding taxes and refunds of the debtors. The bankruptcy code requires that a debtor provide to the trustee, annually, a copy of his or her tax return. This statutory requirement was primarily to ensure that a debtor being afforded protection under Chapter 13 of the bankruptcy code concurrently complied with federal tax law. Surprisingly, most debtors proved to be in compliance and simply provided a copy of the return when requested by the trustee. However, as time passed, this simple turnover of the proof of return didn’t satisfy the trustees. When reviewing the returns, they objected to refunds that were received and tried to determine how they could extract those refunds while the debtor was making payments pursuant to the plan. Enter the disposable income argument. Yes, you guessed it. By the debtor receiving a refund from their taxes, they must not be committing all of their disposable income per month to the chapter 13 plan. Otherwise, there would be no refund, correct? No. That is actually not correct. There are plenty of credits that a debtor may receive when filing a tax return. The most common and important to debtors in an existing case is the earned income tax credit. Thus, a debtor with a refund every year does not necessarily have more money to commit to his or her chapter 13 plan. This issue has been litigated in Chicago with most judges allowing a debtor to keep $1200 of their tax refund in addition to any earned income tax credits for children. In some cases, this is sufficient to satisfy the trustee and to allow the case to continue. In other cases, the debtor does not have the funds to turnover and the case completely derails. Who benefits when a confirmed chapter 13 case, paying smoothly for a year or more, is suddenly dismissed for failure to provide a portion or all of a tax refund? Do the creditors benefit by a dismissal? If creditors who are receiving payments pursuant to a confirmed chapter 13 plan were given the option of whether or not to continue to receive those payments or to have the debtor’s case dismissed, nearly 100% of those creditors would want the case to continue. The debtor clearly wants the case to continue. A dismissal would allow creditors to pursue the debtor once again. The debtor would then have to refile which includes retaking credit counseling, paying another filing fee, providing documentation, signing a petition, being subject to a $4000 attorney fee in the new case as well as appearing at another meeting of creditors. 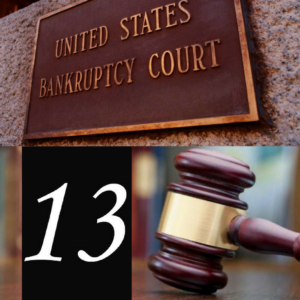 The whole thought of dismissing an otherwise successful chapter 13 bankruptcy case makes absolutely no sense. There must be a better way, right? Yes, in fact, there is. Prior to a case being confirmed, the trustee has an opportunity to review the pay advices, other sources of income, the expenses, the assets and liabilities of the debtor. It is at that time, prior to confirmation, when the proper dollar amount per month is and should be determined. Once that plan payment is determined and the case is confirmed, it should be solid. Anything the debtor receives going forward should not be considered additional income that needs to be put into the plan. And keep in mind, this additional income that the trustee are demanding does not even go to pay off the plan. It is considered additional income. Thus, in a less than 100% plan, the creditors will actually get a higher percentage. It doesn’t go to pay off the actual percentage confirmed. This too is an unfair stranglehold on debtors. My solution is simple. Once the case is confirmed, allow debtors to keep their entire refund, provided they file and submit their tax returns annually to the trustee. Otherwise, the trustees with the acceptance of the Judges’ assistance, are torpedoing otherwise successful chapter 13 bankruptcy cases. In my opinion, this was not the intent of the Congress when they passed bankruptcy reform in 2005. Why take a chapter 13 debtor who is struggling to make plan payments to the brink. Why do trustees and the judges in their discretion, feel the need to make it harder and harder on debtors who are actually complying with the code and with their chapter 13 plan payments. If only creditors had their say. There would surely be a lot less dismissed cases. And there would be a lot more money flowing back to creditors. And after all, isn’t that the point of a chapter 13 repayment plan bankruptcy?